A 4-5 mile walk along the upper reaches of the River Wandle including its two main sources. The walk begins at Wandle Park tramstop or Waddon Station and finishes at Carshalton. Sections of the walk can become muddy. Note: (RL) = river on left & (RR) = river on right as you walk. Look out for Kingfishers! From Wandle Park tramstop go down Vicarage Road and cross Waddon Road into Benson Road. Continue along Waddon Park Avenue. Cross the Purley Way and go right at Waddon Court Road then enter the park on the left. From Waddon Station go right along the Purley Way for a short distance. Left into Waddon Court Road then enter the park on the left. This spring-fed pond is one of the main sources of the River Wandle. A corn mill was recorded in the Domesday Book. Its last replacement closed in 1928. The northern pond was filled in in 1964. Beddington Mill of the 1890's replaced an earlier timber building. There is an adjoining mill house with outbuildings. The riverside cottages (Mount Pleasant) housed mill workers. Cross Hilliers Lane and go around Guy Road (RR) then second right into Church Lane which continues as a footpath into Beddington Park. Go right at the end of the churchyard wall (Church Road). The Domesday Book records a church here but the present building dates mainly from the 14th century with later additions. The cemetery gate opposite has been restored. Carew Manor was occupied by the family from the mid 14th century until 1859 when it was sold to pay gambling debts. Largely rebuilt it became an orphanage (1866-1939) but is now a school. The Great Hall with a hammer beam roof of 1500 remains (Grade I listed). This was commissioned in 1877 by Canon Bridges, Rector of Beddington. He acquired the park in 1859. Go to the right past a dovecote and some cottages. The Dovecote was built between 1715 & 1720 to replace an earlier building and contains 1360 nesting holes. The end cottage has a timber framed wall. Cross the river and follow it to the left (RL). On the left is Canon Bridges' Bridge, made in Torquay. There are toilets in the pavilion building off to the right. Continue to follow the river (RL) passing, but not crossing, a flint bridge then a metal bridge. Opposite this go right along the conifer path then bear left towards a sunken pond. Go up the steps and along the pergola walk. The original Grange of 1880 burnt down in 1960. The present building is now a restaurant. Opposite is Bridge House, built 1782-6 for James Newton, proprietor of Merton Abbey Mills. It has been restored to serve as a care home. On the right is the early 18thc Wandle Bank which was the home of the Pre-Raphaelite painter Arthur Hughes from 1876-91. Go around the roadside pond then cross the road. Go to the right of the Londis Store and Rose & Crown pub into Butter Hill. Follow this road round and at the end turn right into Mill Lane. Just beyond the railway bridge on the right is the entrance to Wilderness Island. This Nature Reserve is managed by the London Wildlife Trust. Paths and a numbered trail lead to the confluence of the two branches of the River Wandle [more info]. Strawberry Lodge which was built for the gunpowder maker Josias Dewye is now a Conference Centre. Retrace your steps back down Mill Lane. Just beyond Butter Hill follow the path & cycleway alongside the river (RR). This was the site of Ansell's snuff mill, traces of which can still be seen. A fish ladder has been installed. Ignore the first bridge but cross the second (at Oakham Road) and continue along the path (RL). At the end enter The Grove (Park) and walk to the right (RR) then onto the bridge at the cascade. This was rebuilt in 1968 on the site of an old weir which provided a head of water for the mill. Continue to the mill building. There has been a mill here since the Middle Ages which originally ground corn. It was rebuilt in 1783 to the designs of John Smeaton. A steam engine was installed in 1854 to provide power when the river was low and increase the number of stones to 10 pairs. Aurelia Cator purchased the mill in 1887 and replaced it with an Alpine style building housing a water-powered electric generator to serve The Grove and Stone Court. About 1909 the water wheel was replaced by a water driven turbine which was in use until about 1923. The mill was restored in the 1980s but the present building was constructed following a fire in 1984. Go along West Street Lane opposite and at the end left along West Street. There are some attractive cottages here. 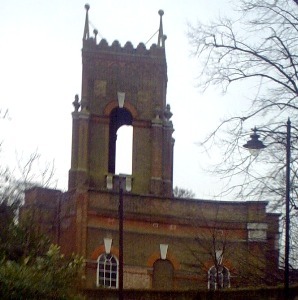 On the right is the Carshalton Water Tower (pictured in header). This Grade II listed early 18th century garden building is sited in the grounds of Carshalton House (now a school). It contained a water-powered pump, which supplied Carshalton House and the fountains in its garden. The building also contains a suite of rooms with a Saloon, Orangery and a splendid early 18th century bathroom with tile lined plunge bath. There is a view of the rear of Honeywood to the right and one of London Great Trees. On the left is the Old Rectory (1690-1710) and the Sutton Ecology Centre. There is a numbered trail around the varied gardens and habitats and a programme of family events. Overlooking the pond is Honeywood which houses a local museum and cafe. Parts of the building are 17th century with Victorian and Edwardian additions. The ponds are the second main source of the River Wandle. On the right is the war memorial and across the pond is a view of the Greyhound pub (rebuilt 1840) and the parish church of All Saints. This was mentioned in the Domesday Book but extended 1890-1913. Cross North Street with care and go through an opening in the wall to the left. Follow the footpath to the right (passing the second pond). The Grove was built in 1840 and leased to the rector W A B Cator in 1856. The building with an overhanging upper story is the Apple Store. Outbuildings including stables now house a nursery. Some notable buildings have Sutton Heritage plaques.